Dong Winter Party: Line Up Complete – The Ticket Sale is On! As promised, here are the last bands of our line up for the Dong Winter Party that is going to rock the Weststadthalle in Essen on February 2nd! It’s about time! We had kind of gotten used to this cozy every other year thing which we had with a certain band at the Dong Open Air. A slight fear crept upon us when we realized this tradition had been broken in 2012, but then we heard a faint voice from the castle. Which castle?! Castle Grailskull, what else?! The Grailknights and their Battlechoir are coming back and fight the good fight for the Holy Grail at the Weststadthalle! Last but certainly not least we shall welcome back another regional beauty in our lineup: Path of Golconda, who had a hard time wiping that smug grin off their faces after experiencing the pure awesomeness of the Dong audience in 2012, are going to be there at the Winter Party in 2013! Support these two bands and Suidakra, Dew-Scented, The Very End, Synathasia and help us save the Dong Cow! “Rise From The Mud” with us and get your ticket now for €16.50! You can also get a nifty package deal which includes a party t-shirt and the official A1 sized motto poster of the 2012 D.O.A. “Gnodzilla – King of the Monsters” for €26.50. You will receive shirt and poster at the party in Essen. - W:O:A Running Order and Holy Wacken Land maps – online now! - Apply for the W:O:A Festival Diary and film your visit to Wacken 2012! - It´s getting dirty! AXE Festival Shower at Wacken! 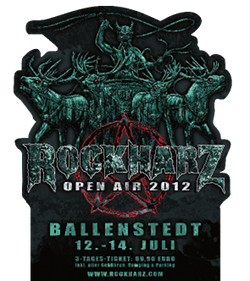 - Wacken:Open:Air Mobile App 2012 is released! You´ll find the complete newsletter at the official homepage! From now on day tickets are available – they cost 59 EURO. Weekend tickets are still available for 104 EURO. After two years of silence Metal Mania Open Air Festival succesfully rised from the dead last year with amusing performences of German thrash metal legends Destruction and Swedish death’n'roll kings Entombed. Although this is the first Slovenian metal open air festival, celebrating its 10th anniversary this year, this is not one of the biggest festivals and neither the one with the worlds most popular stars, but trides itself on pleasant atmosphere in beautiful and idylic landscape of Slovenian Karst, where the main focus is on quality socializing and having fun. The musical side of the festival is also not insignificant, so the headliners of this years edition will be German heavy metal veterans Primal Fear and Norvegian black/thrash sensation Aura Noir, featuring some current and former members of Satyricon, Immortal, Mayhem, Gorgoroth, Ulver, Ava Inferential, Cadaver Inc., Dodheimsgard, Infernö and many others. Of course, there will be some room for a little musical treats, like British cult NWOBHM/doom metal band Pagan Altar, which was established in 1976, but disappeared from the stages in the early 80s. Or Italian black metal group Necromass whose debut album Mysteria Mystica Zothyriana from 1994 is still considered as one of the milestones of this genre. Like every year so far the organizers are trying to offer an opportunity especially to outstanding local bands, who are once again represented quite good.